I may have to give up one of my longest-standing indulgences: the dunking of an Oreo cookie in cold milk (whole is preferred). I don’t do this lightly, as I have been dunking those deliciously wicked rounds of chocolate and what I choose to believe is cream since I’ve been three. Why give them up? Because this week, Irene Rosenfeld, the head of Mondolez (the food conglomerate based in Illinois that has Nabisco in its portfolio), a woman touted for breaking the glass ceiling upon becoming the head of Kraft Foods and then its spin off, announced that rather than invest $130 million in modernizing the plant in Chicago, where Oreos have been lovingly produced for the past 100 years, she will instead move the jobs to a new factory in Mexico. The result: a loss of 600 well-paying and community-sustaining jobs on Chicago’s Southwest Side. Is giving up Oreos a foolish and futile gesture? Of course, I know that other Chicago-born companies have made similar moves. I, like many Chicagoans felt a loss when Frango Mints were no longer hand made on the top floor of Marshall Field’s—and felt worse when Marshall Field’s ceased to exist at all. I was saddened when Klaus Suchard chose to take Brach candy production from Chicago, and in so doing ended Chicago’s title as candy capital of the world. I even regretted the loss of the city’s steel mills and stockyards, despite the cleaner air that their exodus brought. But this seems different. Perhaps it was reading the May stories of Rosenfeld’s report to shareholders in which she touted the upward trajectory of the company’s profits through cutting back on procurement and customer service and her plans to make it even more profitable by a restructuring that would realize a gain of $1.5 billion for stockholders. It might have been reading the very next day that Rosenfeld was now being feted as the first woman to join the “20 Club,” those Illinois CEOS who are paid more than $20 million a year. Rosenfeld was paid $21 million in 2014 alone. Or perhaps, in a city beset by financial woes, it was contemplating the impact of 600 more unemployed people, who had, only weeks ago, represented a well-paid diverse workforce of Latinos, African Americans and whites whose skills and union had earned them a sustainable salary of as much as $26 an hour. Or perhaps, after another weekend of shootings and deaths, it was thinking about the young people who we tell that in staying in school, staying out of trouble and following the rules there is a clear path to opportunity in our city—at the moment that 600 such opportunities in the city evaporated. Certainly Rosenfeld’s move is legal (although whether it should be is another question). But I can find no sense in which it is moral, just or defensible. Rosenfeld and company may say that the move is justified, the reasonable actions of a company to improve their bottom line; that they owe their workers, the city and the nation nothing. But I would disagree. As Warren Buffet and a few other enlightened CEOs often point out, no American company succeeds on its own or without public benefit. Companies benefit from their hiring of workers made literate and trained by a public education system that, with all its foibles, is pervasive and accessible. Corporate trucks enjoy the benefits of publicly financed roads and bridges, maintained at the public’s expense, not theirs. Their commerce itself benefits from government agreements that ensure the rule of law and protect them in a manner that those of few other countries do. And of course the wealth of the company is due to the skill and work of the workers—who turn, in this case, the flour and sugar into the delectable treats that are now enjoyed worldwide. 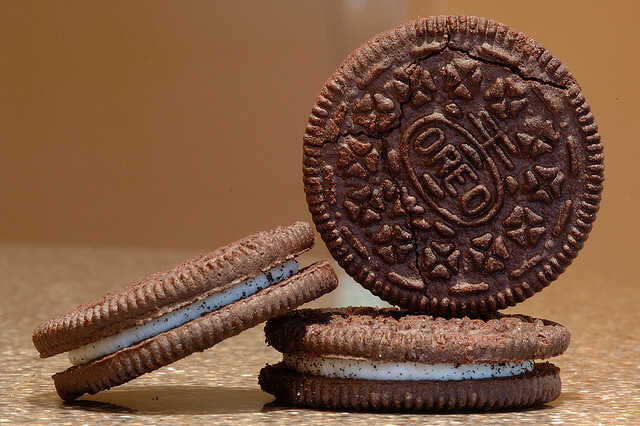 There’s nothing new or even unusual about Irene Rosenfeld and the story of Nabisco and its Oreo cookies. But perhaps its very pervasiveness in our lives is just the thing to wake up the nation to the downward spiral we find ourselves in—a veritable race to the bottom, with a thin layer of the very rich, a hollowing out of the middle, and a growing underclass—relegated to selling merchandize produced for pennies on the dollar in other countries. A friend to whom I spoke about Mondelez counseled that to mention Rosenfeld’s salary is a distraction. But it seems somehow wrong that we praise and reward a CEO for eliminating American jobs or for being paid an amount in one year that would take any worker in her plant 500 years to earn. Come to think of it, if Rosenfeld could learn to live on $2 million a year, that $19 million could be used to save 600 jobs, and the company’s bottom line would still be the same. The same friend, who long has worked in finance said to me, in a manner most reminiscent of the famous quote from The Godfather, “It’s just business” But it’s a business where choices are made. Unlike other nations, our laws today do nothing to discourage offshoring, nor do they create any penalties when companies leave cities and towns holding the bag, left responsible for cleaning the contaminated sites and providing assistance to those left behind. We look at cities like Detroit or Gary and say, in language that only slightly masks its racism, that their sorry financial state is of their own making, and that we are better and smarter than they. But are we? The African-American residents of those cities didn’t create the problems they face. Rather, it was the exodus of auto from Detroit (140,000 jobs lost between 1950 and 1960) that created the first and lasting economic crisis that city faced and faces. So, too it was not the population of Gary that caused its demise but the decision of steel to lower its costs, take the profits gleaned from decades of workers’ production, invest it in foreign lands and leave its workforce behind. Rather than exceptions, we’d be better off understanding them as harbingers of our future—the veritable canaries in the mine whose warnings should be heeded. The last 20 years—from the changes in tax laws of Bill Clinton’s regime through the terrible and costly years of George W. Bush—have favored massive increases in corporate profits with American workers and taxpayers paying the bills and the price. It need not be this way. It was and is not divinely ordained. These are the decisions of humans and other choices can be made. For me? Just as I don’t shop at Wal-Mart where guns are sold next to the cereal, I won’t be eating Oreos. A small and ineffectual gesture, perhaps, but one that will give me some satisfaction while I wait and work for a government that takes a stand. To tell Oreo you're boycotting their cookies, join my Change.org petition.